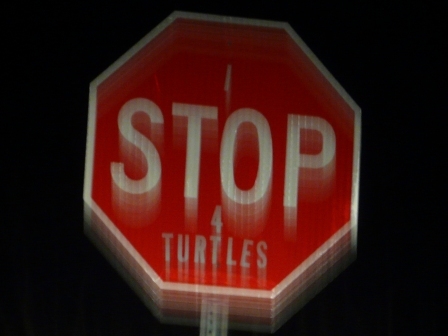 Several weeks ago I posted a short homage to the Sign Bandit of Jumpoff Road who had defaced public property with a turtle-honoring artwork. 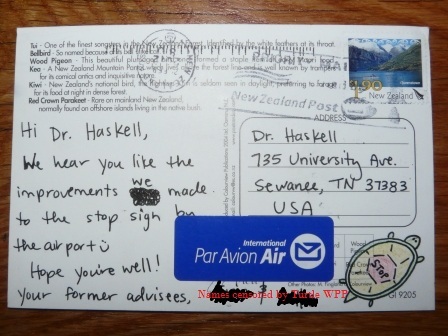 Today, I received a postcard that lifts the carapace on this mystery. Shortly after the Deed was Done, the honorable malfeasants entered the Turtle Witness Protection Program and were relocated south, far south. Bandidas: you make me proud. If you ever sneak back into this country, a beer awaits you. In the meantime, go find a tuatara. Although New Zealand has no native turtles (a few marine ones visit the coasts), the tuatara more than makes up for it. These lizard-like critters have been lumbering along on their own branch of the evolutionary tree for 220 million years. I made a drive-by check-in of the installation just to check on its status last night…still there. This entry was posted in Travels, Turtles on March 8, 2012 by David George Haskell.